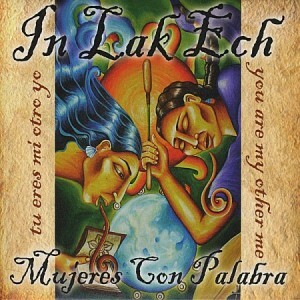 IN LAK ECH – the inspirational Los Angeles, California based performance poetry collective of women – released their debut CD through Xicano Records & Film on August 14, 2007, which was also produced by Martha Gonzalez of Quetzal. Titled “Mujeres Con Palabra” (Women of & with Word) this 20 track CD is a look into mind, heart and soul of Xicana (Chicana) women. In Lak Ech is a Meso-American concept meaning “you are my other me” tu eres mi otro yo. In the flesh, In Lak Ech is a performance poetry collective composed of Liza Cohen Hita, Marisol L. Torres, Felicia Montes, Claudia A. Mercado, Cristina Gorocica Gallegos, Rachel Thorson Veliz and Marlene Beltran, all Xicana multi-media artists, writers, mothers, teachers, and organizers uniting to tell Her-story through poetry and song: in xochitl, in cuicatl. Their words & songs are used to bring awareness and empowerment to the issues of women, family, humanity, and mother earth. Based in Los Angeles, California, the women of In Lak Ech not only perform poetry and song but also organize cultural celebrations, participate in conferences, and conduct workshops for diverse communities. These performances are used as tools for expression, healing, communication, and organizing at various community centers, festivals, high schools, universities, and indigenous ceremonies. Since ’97 the women of In Lak Ech have been performing spoken word, singing songs, and telling herstory from the concrete jungle of Los Angeles to the jungles of Chiapas. Their latest CD Mujeres Con Palabra (Women of & with Word) is the product and documentation of those 10 years.